If you've set up your WooCommerce integration you can manage your Brand Profile directly through your Inkthreadable account. It's a good idea to do this before you start managing your products to make sure your labels are ready to assign to your products before they're ordered. If you haven't already integrated your WooCommerce store with us then that's your first step. But if you have, let's get started. 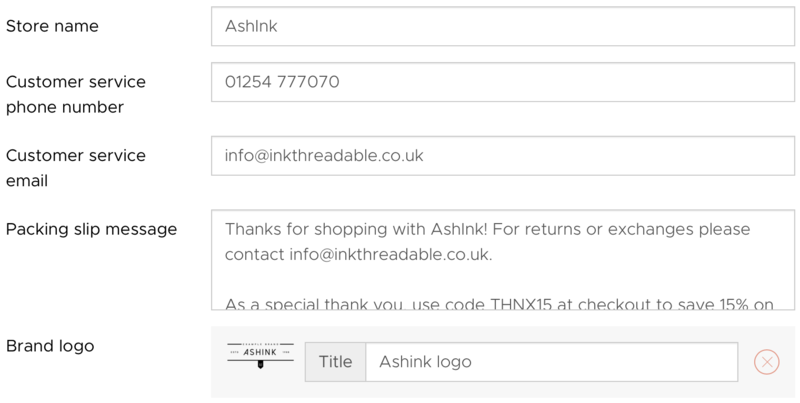 Log in to your Inkthreadable account and, once your store is integrated, head to your Brand page. Click the Add new brand button. Here you can add your brand's name, contact info, thank you message and logo as you'd like it to appear on your packing slip. Packing slips are included in your parcels free as standard and contain only the information you add on this page, along with details of the items included. You also have the option to upload brand labels to your Brand Profile. These are optional DTG labels printed in the back of the neck to a maximum size of 8x8cm. Each printed label costs £1.51 and is added to the cost of production when added to your product variant during set-up. Sizes aren't required on neck labels but it's one route you could go down, but most customers simply run with their brand logo. Once you're happy with your Brand Profile click the Update button.